FlexNetworks owns, manages and operates extensive fibre-optic networks. Our current core geographic footprint includes Ottawa, as well as the Saskatchewan cities of Regina, Saskatoon, Prince Albert, Moose Jaw and Estevan. Privately held, well-funded and managed by a successful team with exceptional telecom expertise, FlexNetworks thrives on providing scalable and flexible solutions to meet current and future connectivity needs for organizations, enterprise business customers, service providers and carriers. As a facilities-based provider, we offer tailored solutions to medium and large organizations looking for flexibility. We ensure your network has the scale and bandwidth it needs, within your budget. Are you a bandwidth-hungry organization needing ultra-high speed connectivity? FlexNet™ virtual private line services offer both scalable and flexible bandwidth solutions, making your organization more efficient by optimizing IT expenses and increasing productivity. FlexWave™ is an engine for economic growth that unlocks your organization’s potential, allowing you to compete globally. FlexIP™ is a technology enabler, allowing you to utilize next-generation cloud-based applications like virtual PBX and VoIP, Unified Communications, SaaS and o365. FlexDark™ offers peace of mind by ensuring business continuity, unconstrained throughput and security. FlexNetworks’ footprint is growing every day, and with it our site serviceability. We will gladly assess the feasibility of running our fibre-optic cable to your business. Submit a request to see if fibre-optic services are available nearby. Download our commercial and service level agreements below. June 8, 2018, Regina, Saskatchewan Kris Eby, FlexNetworks, Chief Operating Officer and Honourable Ralph Goodale, Minister of Public Safety and Emergency Preparedness. 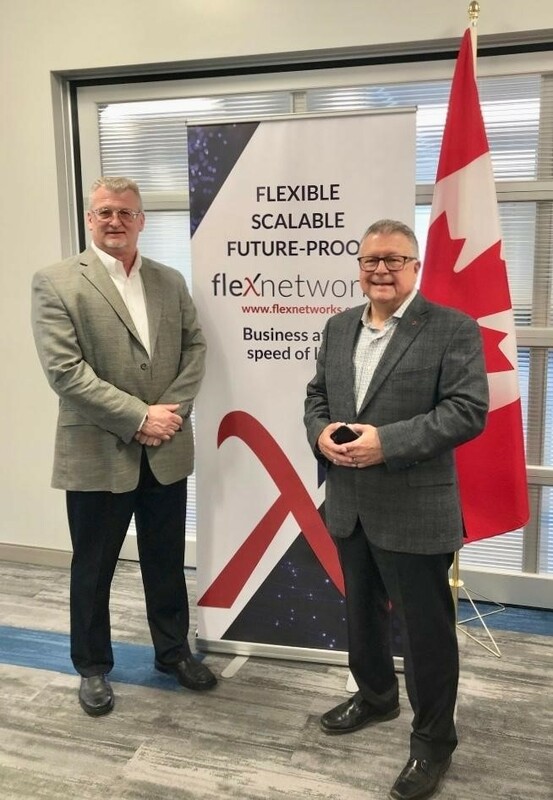 FlexNetworks was awarded $5.95 million in funding from the Government of Canada as part of the Connect to Innovate (CTI) program. CTI is a government-led initiative to bring access to high-speed or faster Internet to 14 underserved communities in Saskatchewan. “The Connect to Innovate program has the power to transform the lives of thousands of Canadians and businesses, and FlexNetworks is excited to play a part in this transformation,” said Jacques Taillefer, Executive Vice President of FlexNetworks. make them a complete and utter delight to work with." "We were looking for an alternate provider in Saskatchewan with their own carrier-grade fibre network. The value of FlexNetworks’ service is exceptional." "FlexNetworks understands their customer needs and business, then work in partnership to find a right-fit solution." "FlexNetworks met with us and tailored a cost-effective solution." "When I speak to others about FlexNetworks, the words that jump to mind are: Trust, Integrity, Attentive." Ultra-high bandwidth connectivity is what we do best. Have a project in mind? Looking for ultra-high bandwidth access? Interested in redundancy? We would love to hear from you. FlexNetworks has many years of experience designing and delivering custom solutions to meet and exceed our customers’ expectations. Your message was sent. You will hear from a member of our team shortly! Use our extensive experience to deliver the solutions you need. Never miss an update! Be the first to receive our latest blog posts to learn about business at the speed of light. Be the first to receive our latest blog posts to learn about business at the speed of light. Request access to our commercial and service level agreements. FlexNet™ virtual private line services offer both scalable and flexible bandwidth solutions, making your organization more efficient by optimizing IT expenses and increasing productivity. Don’t let your current service provider throttle your growth potential. Choose a flexible solution that makes it easy to grow. You pay for what you need, and just what you need. FlexDark™ offers peace of mind by ensuring business continuity, unconstrained throughput and security. A dark fibre connection to your off-site data centre or back-up storage site provides redundancy and ensures minimal disruption. Safeguard your business from costly downtime and guarantee data sovereignty with FlexDark™, giving you full control over your own telecommunications network within our network. Leased infrastructure that you control. FlexWave™ is an engine for economic growth that unlocks your organization’s potential, allowing you to compete globally. Rival the big players on your turf. With speeds of up to 100 Gbps of throughput, FlexWave™ offers endless possibilities. Helping you manage today’s massive data demands. FlexIP™ is a technology enabler, allowing you to utilize next-generation cloud-based applications like virtual PBX and VoIP, Unified Communications, SaaS and o365. The mobile millennial approach of working anywhere, at any time, and on any device, requires a reliable, steady service like FlexIP™, assisting you to attract and retain great talent. With dedicated Internet connectivity options ranging from 100 Mbps to 1000+ Mbps, FlexIP™ is ideal for organizations that need guaranteed speeds. Helping you connect and stay connected. With dedicated Internet connectivity options ranging from 100 Mbps to 1000+ Mbps, FlexIP™ is ideal for organizations that need guaranteed speeds. Since FlexNetworks is “carrier neutral” and connects with various carriers, you have the unique option to acquire your IP Transit from your preferred Internet Service Provider. FlexNet™ services offer you standard and stricter levels of service delivery tailored to your applications. FlexNet™ allows you to connect locations within a service area using Ethernet protocol. FlexNet™ supports transmission speeds scalable from 10 Mbps to 1000+ Mbps. FlexNet™ can grow with your business when you need it. Bandwidth changes are fast and easy. You choose a bandwidth profile that fits your real traffic needs. Not only does dark fibre provide the highest level of security, FlexDark™ services give you full control over your network. FlexNetworks allows you to have your own telecommunications network within our network. FlexDark™ is perfectly suited for redundancy, data centre connectivity, cloud computing and applications that require really serious bandwidth.